When ordering a Sugarlace Cakes creation you’re getting a delicious and unique cake. Each creation is baked and decorated by Leticia and can be based off existing designs. New designs or concepts can also be created. For Flavours and Portion Sizing, check out the information below. 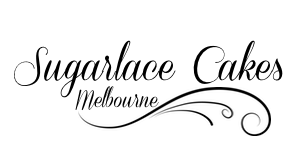 If you have any other flavours in mind that you would like to discuss for your upcoming cake, send an email to leticia@sugarlace.com.au and we can look into what the best option will be for your event. Additionally, please let me know if you have any dietary requirements and we can choose a recipe that will suit your needs! Please keep in mind that the sizes in the chart above are based on the cakes finishing at a standard height of 4 inches. If you want the tiers to finish at different heights, we can distribute the proportions to suit the look you’re wanting to achieve and cater for your guests. Also, please remember that slab cakes can be arranged for larger weddings. To order your Sugarlace Cakes creation head over to the Contact page.